Virginia Campus hosts seventh annual STE Day for Loudoun County high school students interested in applied sciences. High school students use computer coding to program a Handy Board robot car at STE Day. Senior Prathyusha Pinnamaneni slipped on a stethoscope and examined the pregnant woman’s protruding belly. She listened intently for a few seconds, and then moved the chestpiece a few inches to the right. “One hundred and thirty,” she reported after a pause, accurately noting the infant’s heart rate. Not bad for a high school student. Ms. Pinnamaneni, a Freedom High School senior with hopes of attending medical school, stood over a computer-controlled mannequin in a mock check-up scenario at the Nursing Simulation and Skills Laboratory at the George Washington University’s Virginia Science and Technology Campus (VSTC). She was participating in the seventh annual Science, Technology & Engineering (STE) Day, held on April 11. The campus organized 11 hands-on workshops for sophomore, junior and senior students from 13 Loudoun County high schools. Packed buses dropped off more than 120 kids, eager to participate in three science sessions of their choice. VSTC Dean Ali Eskandarian opened the event by welcoming the students and talking them through the some of the strange aspects of modern physics. After the quick overview, the students were off to their first two sessions of the day. Park View High School senior Kathy Tran hunched over a computer in one classroom, her brow furrowed as she typed out an Interactive C code. 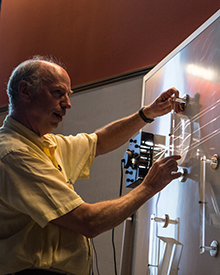 The session, called “Greater than the Sum of its Parts: Integrating a Robotic System,” taught students to manipulate a Handy Board robot car using computer coding systems. “I’ve always wanted to try programming a robot, but I’ve always failed because I don’t know where circuits go. 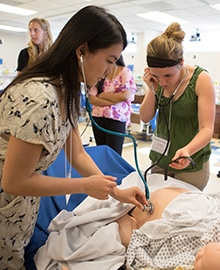 It’s awesome to have this hands-on experience,” Ms. Tran said. Following a lunch break, the high schoolers tuned into keynote speaker Tim Harris, the director of the Applied Physics and Instrumentation Group at the Howard Hughes Medical Institute Janelia Farm Research Campus. During his discussion, “Tools for Neuroscience Research,” he shared his findings on creating new tools for molecular studies and then demonstrated the key functions of microscopes by building one with large lenses and handheld lights. He ended his talk by stressing to students the importance of understanding several disciplines to be a good neuroscientist. “Neuroscience is the broadest field I have ever participated in. There is room for everyone, from mathematicians to people who like to pet rats, and everything in between—machinists, computer programmers, molecular biologists, anything in science,” Dr. Harris said. In the last session of the day, Ms. Pinnamaneni mixed tiny bottles of oils, herbs and powders into a green paste. 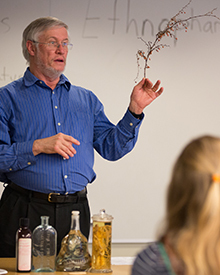 “Herbal Medicinal Compounding,” led by Wendell Combest, a professor of pharmacology from Shenandoah University, gave students a chance to formulate a salve to soothe insect bites and poison ivy. Groups of high schoolers took turns sniffing their lotions and rubbing them against their skin. Just down the hall, sophomore Brennan Wright and junior Nick Blackley from Heritage High School sprawled out on the carpet with a small launching device they’d crafted out of rubber bands, plastic rods and pencils. As part of “The Flight of the Ping Poll Ball,” Assistant Professor of Engineering Megan Leftwich had given them an initial velocity formula to calculate how far their launcher would throw a ping poll ball, and the pair was on a roll. “Yes!” Mr. Blackley cheered as the ball flung several feet across the room. When it was time for the students to file back onto their buses, they chattered excitedly about their favorite sessions and what they’d learned.